CHINA leads the world in many aspects of renewable energy and has an electric vehicle industry that is receiving the kind of state support that is very probably making foreign competitors green with envy. The explosion of commerce via the mobile internet takes your breath away. Average per person spending on mobile devices was $3,900 in China last year compared with just $345 in the US. It is also certainly true that China’s infrastructure is light years ahead of many other developing and developed countries. “The state of our roads and rail links in the US is quite frankly a national embarrassment when you make a comparison with China,” said a US chemicals industry executive who recently visited China. But China has an environmental crisis the scale of which has never been seen before. For example, it would take more than the entire world’s wealth to fix its soil pollution. And China’s rapidly ageing population means that it is in a race against time to replace failing old forms of growth with the new forms of growth I’ve highlighted above. If it hadn’t been for its One Child Policy it would probably have had a decade or so longer before it found itself in a middle-income trap. China can no longer compete in some low-value manufacturing sectors because of rising wage costs that are the result of its ageing population. Millions of jobs are thus at risk. So it must sustain the kind of explosive growth it has in seen in new industries such as mobile internet sales to replace these lost jobs. Meanwhile, the people who live in its less-developed provinces are as one European chemicals industry executive says “economically and socially light years away from the rich middle classes in provinces like Guangzhou”. He recently returned from a trip to China’s Rust Belt – the northeast provinces of Heilongjiang, Jilin and Liaoning – where income levels are much lower than in rich China. At least in rich Guangzhou, if someone loses a job in a cheap assembly plant they are likely to quickly find work in a new higher-value manufacturing or service sector. They may well also be sitting on a pile of wealth, thanks to the property boom in China’s bigger towns and cities. There is no such safety zone in poorer parts of China because of the lower income levels and lack of property wealth. But poor China is under the same pressure as rich China to shut down inefficient and heavily-polluting steel and aluminium plants and coal mines etc. 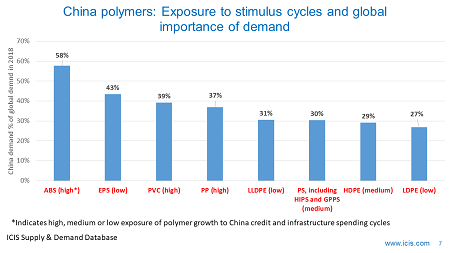 We don’t know whether China can avoid a financial-sector crisis resulting from its build-up of bad debts. Debts have reached levels that have always in the past led to financial crises and recessions in other countries. The key to success for China is making the One Belt, One Road (OBOR) initiative work. Nothing on this geopolitical, geographic and economic scale has been attempted before. It involves some 65 countries that have to agree new free-trade deals. Meanwhile, China has to find around $1 trillion in infrastructure investment to make the OBOR work. 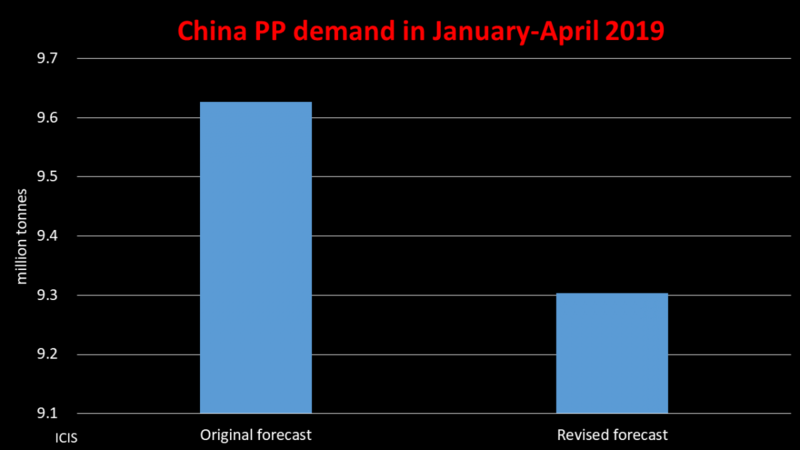 Let’s hope that China can make its latest “economic miracle” work. 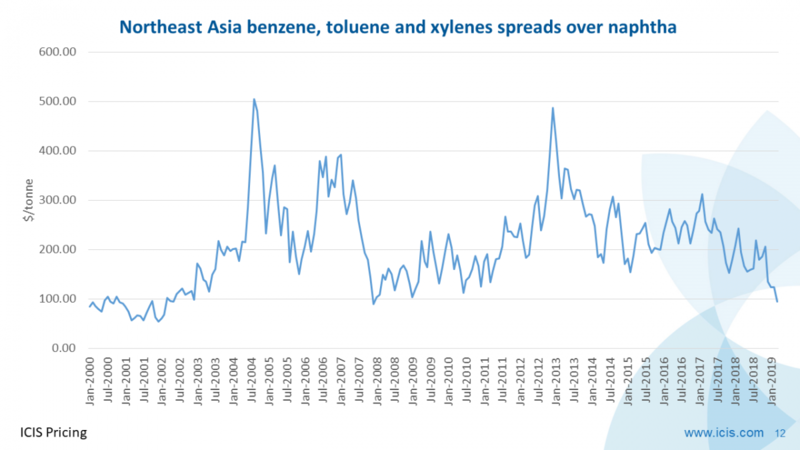 But hope is not a strategy for a petrochemicals companies. Good planning is, though. You thus need scenarios for what complete success, partial success and failure might look like for consumption growth in the value chains in which you operate. Scenario 1 is our base case in the ICIS Consulting Supply & Demand Database. China easily deals with its debt problems. Growth in the new economy makes up for shutdowns of heavy industrial capacity. Environmental degradation is brought under control. China escapes its middle-income trap, thanks to successful implementation of OBOR. GDP growth averages 5.6% per year between 2018 and 2025. 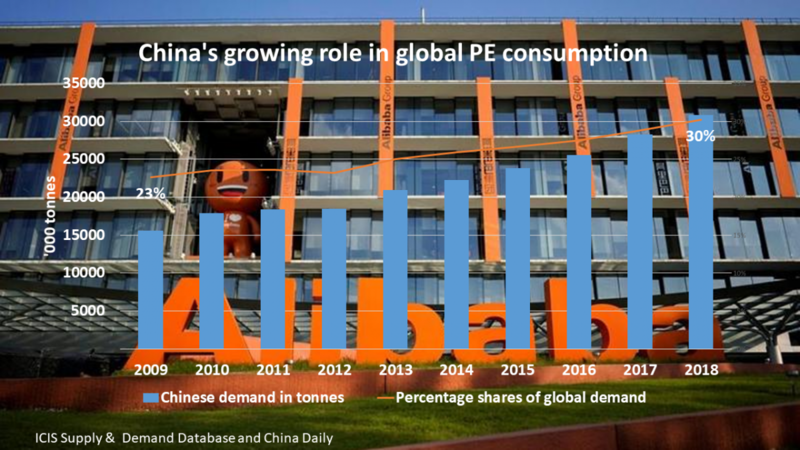 PE consumption is 10m tonnes higher in 2025 compared with 2018. Scenario 2. Debt problems are a drag on the economy for several years, but a full-scale financial- sector crisis is avoided. New industries continue to thrive, but growth is more muted than during the early years of their development. The air pollution crisis is resolved, but soil and water pollution remain major burdens on the economy through escalating health and food-import costs. The OBOR programme is only a partial success because of the complexities involved. GDP growth averages 4.6% between 2018 and 2025. 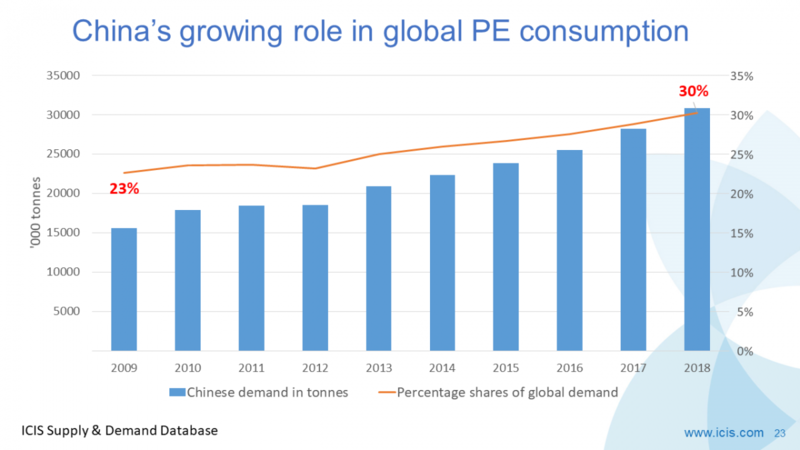 Using the same multiples of PE growth over GDP as in our base case, PE consumption is 7.8m tonnes higher in 2025 over 2018. Scenario 3. 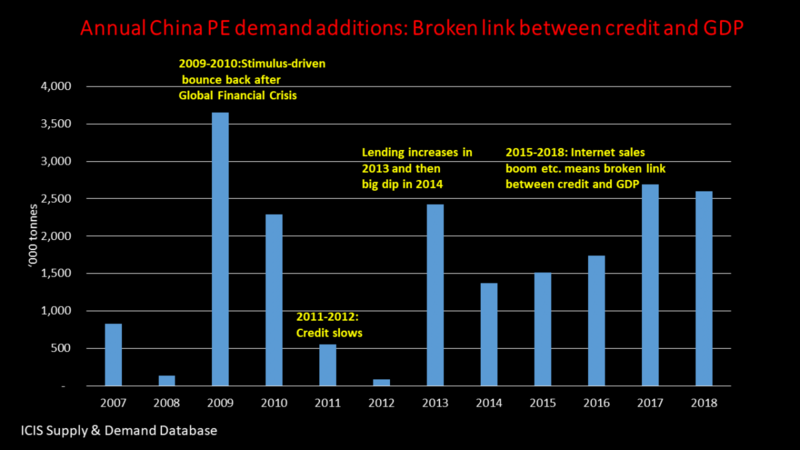 There is a major financial sector crisis in China. The growth of new industries fails to compensate for the restructuring of old industries. 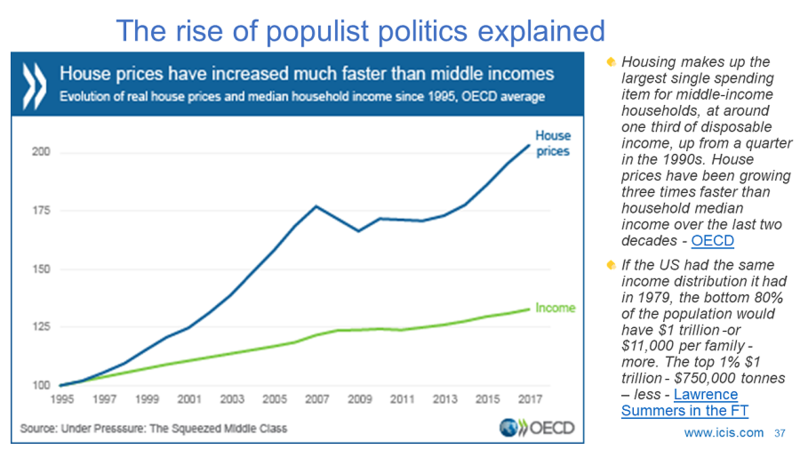 This is because of a large exodus of many of the middle class people China needed to retain if it was going to escape its middle-income trap. The middle classes leave China because of a failure to bring air, soil and water pollution under control. Meanwhile, health, food-import and other costs resulting from environmental degradation escalate to levels that China cannot afford. The OBOR programme fails because of its political and economic complexity. GDP growth averages just 3.6% between 2018 and 2025. 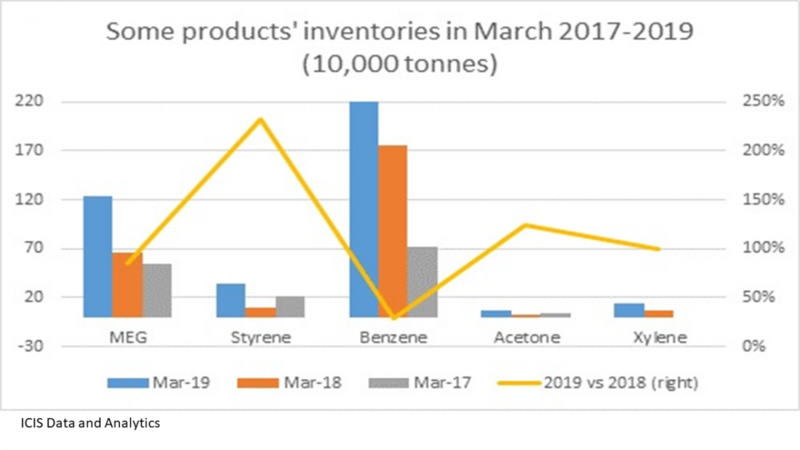 Again using the same multiples over GDP that we use in our base case, PE consumption is 5.7m tonnes higher in 2025 compared with 2018. This, as always, just scratches the surface. For details on how we can help your company build detailed scenario plans for different countries, regions, and petrochemicals value chains, contact john.richardson@icis.com.